July 12, 1979: The sky was raining flat black discs and lit M-80s. By the late innings, the visiting Detroit Tiger outfielders wore batting helmets in the outfield. A vendor reported selling 49 cases of beer that night, more than double the number he’d sold on any single night in his many years on the job. Smoldering bongs were passed from hand to hand up rows like change for a hot dog, giant glossy paper airplanes made of promotional posters featuring a sultry blond model known only as Lorelei swooped and dove amid the hail of explosives and frisbeed LPs and 45s, and inebriated throngs in the parking lot jumped up and down on cars and set fire to white-suited John Travolta dolls and searched for illegal entry into the slightly more focused mayhem inside the packed stadium. As game one of the scheduled doubleheader progressed this search gained urgency, for between games a local 24-year-old disc jockey and the aforementioned Lorelei were going to detonate a mountain of disco records. The revolution, the pointless, hysterical revolution, had come. Some lit bonfires in the outfield. Some wheeled the batting cage around like it was a stalled car that needed a running start. Some performed hook slides and headfirst Pete Rose plunges into where the bases would have been if they hadn’t already been ripped from the ground and stuffed between giggling ribcages and the fabric of Led Zeppelin and Aerosmith T-Shirts. More than one person reported seeing couples fornicating, one of these reports asserting that this occurred in at least one instance in something of an orderly fashion, the participants feverishly attending to one another in stages corresponding to the general location of the aforementioned bases. Cub scout troupes and the elderly watched from the stands. Inside the home team’s clubhouse, as his teammates went through the motions of preparing for a second game that they had begun to correctly assume would never be played, Fred Howard, shown here in the only baseball card ever produced in his likeness, tried to wash off whatever residue had accrued during his stint as the losing pitcher of game one. Though he probably didn’t see it this way, he had done his part. 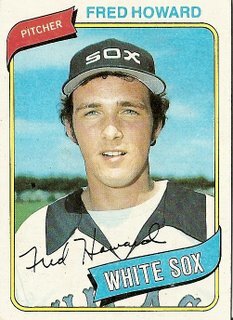 As another contributor to the webpage cited above recalled: “The Sox lost the first game to Detroit, which just seemed to aggravate and energize the crowd.” No one seems to remember Fred Howard, or even to ever have been aware of his existence, but the 1970s, that tale told by an idiot full of sound and fury signifying nothing, may not have had its decade-punctuating Woodstock without his heroic failure. You are currently browsing the archives for the Fred Howard category.